It's the start of every era, and every EPOCH new. Even every EON, and every age it will end, too! Days and months are ours. But who can tell the times that it went thru? If you're looking for a man to romance, I'M IT! If you're looking for a man to take a chance, I'm it! Who had no FLAWS at all, TE AMO, -- I ain't it! FIR, mis-guessing the Natick of SONsAG x sE AMO. But I didn't erase anything! CSO to moi. We used to say "jinx you owe me a Coke", not to be confused with "Jinx, you owe me 20 bucks" which I still hear occasionally. I always thought the modern term for the MAN-BAG was murse. Usually carried by guys with MAN-buns and moobs. IGLU was easy because I remembered the recent discussion here at the Corner. KMart has almost no followers, that's the reason they are in their death throes. When I started my MBA program (circa 1990) the professor of the first course said "Sears is dead, they just don't know it yet." Thanks to Michael and Patti for the fun puzzle. I especially liked "ant-sy complex" for COLONY. And thanks to JazzB for another detailed review. Fun stuff! Got through this one quickly. Got the theme, too. 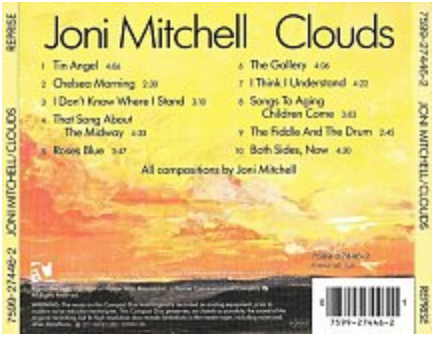 I've got four JONI MITCHELL albums on my music server -- thanx to AvgJoe. Was familiar with JINX, but not in this context. Hand up for RPMS. Lotsa team names to wade through: NETS, MAV, BAMA, JAYS, thank you, perps. And, thanx to Michael, Patti, and JzB for the diversion. EON: I'm pretty sure this is much longer than an EPOCH. My sixth grade teacher pronounced it E-Potch. She also pronounced the H in Thames. She suffered a heart attack before Christmas and never returned. MANBAG: Didn't know that's what it's called, but I've got one. It's similar to the Lledar in JzB's link. I use it to carry my books and supplies during tax season. ENLISTEE: I was one, but not a "willing" one. I quickly enlisted in the navy after receiving my draft notice for the army -- lesser of two evils. Those were pre-lottery days. Thank you Michael Ray Jacobson and Patti Varol, and thank you JzB ! GEE whiz ! Tough Wednesday for me. Never was a big JONI MITCHELL fan as they didn't play much of her on the rock stations I listened to. But even though BOTH SIDES NOW and BIG YELLOW TAXI got plenty of airplay, I never heard of either album. Still filled it all correctly in good Wednesday time, thanks to the perps and a few educated guesses. e.g. IGLU gave me the L ending in the unknown CARL. Loved all the sports references. They were solid perp help ! JzB, thanks from providing the link to the HEJIRA album. Ah, it means "journey." I only left that odd fill because I knew HANNAH, and was confident with JINX (CSO !). "Jinx on you ! You owe me a coke" or something like that was a sing-song heard in my youth. You had to be the first to say it. Mined-over-matter = ORE - Great clue ! Loved it. Pet problems? was another great clue. Noticed that we had a MAN with a BAG and a SON with a TAG. OK, that's a stretch. FLN, surprised that no one commented on the Cultural Taboos, especially the penalty for smuggling or using chewing gum. Jinx, I guess it wasn't just a local saying. My sister was big on saying it, but I don't think I ever bought her a coke. Did you watch the Duke v Kentucky game ? First half, Duke 59, Kentucky 42. Second half, Duke 59, Kentucky 42. That's consistency ! After filling BOTH SIDES NOW, BIG YELLOW TAXI, & CLOUDS I was fairly sure that the unifier would be JOANIE MITCHELL but that was too many letters. . The paper was smudged as I had to write over some letters to correctly spell JONI. HEJIRA looked odd but the perps were solid. I never knew album titles other than the obvious, Sgt. Pepper's Lonely Hearts Club Band...etc. 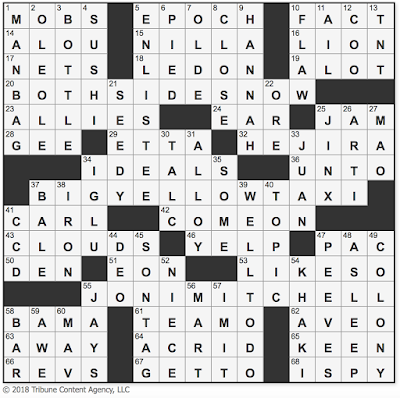 I had to guess the cross of SONTAG & TEAMO, both unknowns. CSO to JINX but that's another saying I never knew. LIKE SO- a bad clue or forced fill. I've never heard anybody in my neck of the woods say 'like so' after demonstrating anything. Like 'this' or 'this way'. I remember teachers trying to tell us not to use like as a comparison. I guess the language overtook the rules. Looking at Clouds again. Not the fun kind. I loved teaching my grands to look at the clouds and tell me what they saw. So much fun. Thanks Michael and Patti. This was easy peasy, as I just read that today's was JONI MITCHELL's birthday. BOTH SIDES NOW seems to have more meaning for me today than it did when I was young. BAMA was easy. I have heard that no one ever schedules a wedding on the day of the BAMA-Auburn game. Thanks for the fine tour and perfect links, JazzB. Nicely done encore. Bravo. My hand is also up for COLONY's clue: Ant-sy. Yes, JINX, too. We definitely said, JINX, you owe me a Coke, but I don't remember any pay ups. AWAY reminded my of our trip to Maine. In the Pine Tree State, you're either from "here" or "AWAY." Native born or not. Kind of like Texans, eh? No matter how fast you tried to get there. . . .
Make some sunshine today. Have a pleasant one. Referential puzzles fluster me so I just meander around until I get my bearings and, eventually, I catch the drift. My only w/o was Theme/Topic but I needed perps for Ole Ole, Hejira, Aveo, Big Yellow Taxi, and Carl, as clued. Iglu was new to me but certainly inferrable. My favorite C/A was Pet problems?=Peeves. Nice CSOs to CanadianEh (Jays), DO and Anonymous T (Mav) and Jinx (Jinx). Overall, a smooth, pleasant solve. Thanks, Michael (Congrats!) and Patti, for a mid-week treat and thanks, JazB, for the always informative and entertaining expo. -I know of Joni Mitchell, but I hardly know any of her songs. FIW by one cell. I had JAYS for 55d and forgot to revisit it when I filled in the rest of the downs to get 55A -ONIMITCHELL. -I have never liked LIKE SO, but I have heard it often. I prefer LIKE THIS. Did you ever have someone show you something at the computer by swiftly typing and not stopping even a second for you to read the prompts. Then they say LIKE SO. Huh? -When people say "I have a problem with that," it is often very minor and just a pet peeve. -Alan seldom names the TOPIC before he speaks, starting in the middle. Even being familiar with his speech, sometimes he is hard to follow. -In the old days many men carried briefcases to work. With the advances in electronics, briefcases were no longer necessary for some men, including my ex included, who then used them to carry lunches and sundries etc. Soon men used back packs for their stuff. Man bags were a logical next step and I see more and more of them used by all types of men. It makes sense. I would be hard pressed to give up my purse for carrying stuff. -Sunny today and a few degrees above average for November in NJ with blue skies and puffy clouds. We reached our foliage peak 5 or so days age. In the early morning and late afternoon the sun shining through the brilliant reds and lovely oranges makes a golden glow. The leaves are falling fast now, but are still pretty. I love fall and spring. GRR! Days AGO not AGE. Seemed to have more of the midweek 'bite' of the NYT or WSJ offerings. Since I was not familiar with MS MITCHELL's work, the related fill depended heavily on perps and, so, were learnings. Much clever cluing: COLONY, TALC, PEEVES, and ETTA. causing a few chortles. CSO to Jinx, which helped get ………YELLOW TAXI. Nice job,Michael and Patti. JzB had a fine intro, as always.. Being proudly ignorant of all team sports, and only vaguely aware of Ms. Mitchell, I was lucky to complete this with only the I and X missing from the HEJIRA/JINX crossing. At the time of her early appearances, I was in Europe (1970-71), then embroiled in the loss of both my parents in 1973-74 amidst our move to the USA, then in 1976 with starting a family. I've also never heard Jinx said in that situation, only the action of pinky linking. Like Jazz, I felt a bit uncomfortable with some clues. For example, to me, khaki is more a color than a fabric, and DEN doesn't spring to mind as being in the woods. I think of khaki more often as a fabric than as a color, although both are common. We often use khakis to refer to trousers made of khaki fabric. Merriam-Webster "a light yellowish-brown cloth made usually of cotton or wool." The foxes have a den in the woods behind our home. They are shy and hard to spot. We haven't been visited by the turkeys for a while, but we are seeing more and more deer right now. Google says of foxes, "Dens are mainly used just as "birthing dens" and most foxes will choose to sleep out in the open and use their tails to cover their noses in order to stay warm. However, when a red fox does use a den, it will usually just enlarge an existing rabbit or marmot den instead of going through the trouble of making its own." Michael and Patti, thanks for the fun which went quickly for me. I loved Mined-over matter for our old friend ORE. I also liked Pet PEEVES although I understand the hesitation over them being Problems. Ant-sy complex for COLONY made me laugh. IGLU... yes I remembered our lesson on Inuit houses. Thanks JzB for walking us through. -My LA BlogSpot page with Jazz’s great write-up had a MAN BAG ad on the right. My “MAN BAG” comes out only when I sub and it has my computer, its gear and candy- no moisturizers or gels. -A COME ON – Free, just pay shipping and handling! Be careful. HUsker, sorry for the loss of your niece. I've been busy trying to help with local pursuits and have missed most posts recently, so didn't know what has been happening here. YR, I guess I have a rather narrow frame of reference on some things. Around here we are more aware of deer in the woods than anything else, and my uniform (school, way back in my day) was made of brown serge, in winter anyway. Hi Y'all! Thanks, Michael & Patti for a challenging puzzle. Thanks, JzB for a great expo! Hand up for not knowing Joni Mitchell's work and didn't recognize her face. The name was familiar. BOTH SIDES NOW came easily with a few perps, but I thought it was someone else's song. I had four babies from 1965-1976 and that EON was a haze of kid stuff. HEJIRA & BIG YELLOW TAXI were all perps & WAGs. Also DNK: CARL, YELP, HANNAH, JINX as that game (altho "our" JINX seems game for anything). Has SON & TAG was a lucky WAG. Last to fill was the top center bloc. "Gloria in Excelsis DEO" the weather cleared just long enough for my farmer to cut my soybeans two months later than usual. Rain yesterday afternoon and snow expected later this week, I was nervous. So I will be able to pay my property taxes and also eat this winter out of the income. What a good puzzle for a WED!! All us Baby Boomers should have liked this one. Great words, great theme, and tough cluing, Anyone who can get HIJIRA into a puzzle... well you gotta tip your hat to them!! MANBAG- If I could describe Metrosexual in one word, that would be the word! HANNAH STORM; My sister-in-law and her were classmates at ND back in the day. For Sports nuts like me, here's an FYI... her husband is Dan Hicks the NBC/Golf Channel play-by-play broadcaster. I think they met at ND. JONI MITCHELL: probably my favorite female artist. Her bio is really interesting. Laurel Canyon days especially. But, how can you smoke as much as she does and still be walking around at 75??. She always has a cigarette in hand. BIG YELLOW TAXI: Along with "COURT AND SPARK" my favorite album of hers is "MILES OF ISLES" recorded at the LA Amphitheater with Tom Scott and the LA Express. It probably has the best version of BYT on it. Well, this was a real toughie for me--more like a Saturday than a Wednesday. I just don't know much of anything about JONI MITCHELL, so the only theme clue I got, thanks to perps, was BOTH SIDES NOW. And that song now just stays in my head ("I've looked at life from both sides now . . . . It's love's illusions I recall, I really don't know love/life [?] at all"). Oh well, my blanks are not the constructors' fault and am glad that others had no problems with the puzzle. And delighted to see the shout-out to Jinx, and the nice write-up by JazzB. Glad the election is over. Funny that you can be "proudly ignorant of all team sports". Seems a bit elitist to me. Snobbish. I am well aware of my shortcomings on many subjects. As I watch Jeopardy, I often think of how I would perform on a certain subject or what I would wager on a Final Jeopardy subject. Oscars, Shakespeare, astrology, French or British royal families would make me cringe and wager nothing. Geography, sports, TV shows, rivers or music and I'm betting the farm. I have no desire to expand my Shakespearean knowledge but I would never say I'm proud that I dont know my Caplets from my Montegos. Many of you guys, not only metrosexuals, are carrying man bags without using that term for them. Almost any bag a man carries his stuff in is a man bag. More and more men are being practical and carrying bags for convenience. Even back packs count as man bags. Asking your girlfriend or wife to carry your stuff in her bag in IMHO is not very masculine. "The survey revealed more than half of men now carry around a bag and two thirds are concerned about security and carry their wallet safely in a bag rather than their pocket." 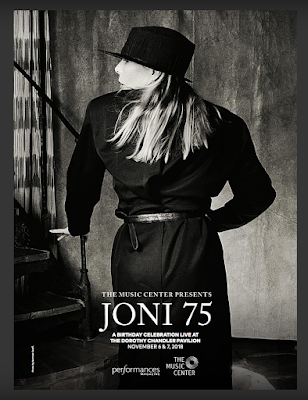 Joni M a big fav, her best is Court and Spark but her other albums are top notch. What a talent. The Democrat won in my district, SC 1, he beat a real harpy who was expected to win, she was up by 7 according to all the polls. First Dem since the 1980s for this district and first new Dem in Congress from SC since 1992. Wow. The puzzle...a nice Wednesday test. Minimal markovers....ATON b4 ALOT, RPMS b4 REVS, and that was it. Gary - so sorry to hear about your niece, That is way too young. Now - if two people say "Jinx, you owe me a Coke." at the same time, what happens? First, FIR should have read FIW, if anyone gives a rat's patootie. TTP - It was a great game to watch, even if Duke made my favored KY Wildcats look like The Generals playing the Harlan Globetrotters. What a team those Blue Devils have! PK - yup, I'm generally game for anything (at least once). Great news about your soybeans; glad you can keep the heat on. YR, I don't think of backpacks and briefcases as being man bags. I still carry my old, battered Hartmann briefcase. I liked the first article, especially "Why pay £500 for something unless you want to be marked down as a try-hard poseur?" But when the second stated that "the survey of 2,000 men revealed one in ten per cent pack spare underwear in their bags" I had to scratch my, er, head. What? I wonder if that equals one percent? Could it be British for "one-in-ten, OR ten percent?" In either case I would rather pack emergency TP. My boxer-briefs have two sides after all. This was hard for me, not knowing anything about Joni Mitchell except her name and photograph. But most perps came to the rescue; some, however, didn't help. Having worn uniforms during my military service, I had always thought khaki was a color, not a material. Even the dictionaries call it a brownish cloth made of cotton or wool. So, to me, the fabric is cotton or wool or some other combination of materials, and the color is khaki. In the military, when we said we are wearing khakis we were referring to the color, like saying we are wearing blues or whites. Actually, the uniform I wore in most circumstances was tan in color; I believe the fabric was gabardine. I loved the clue for PEEVES, but I don't understand why "ant-sy" has the hyphen in it. Interesting that IGLU was a TOPIC of discussion not long ago. My dad used to say "like so" when showing me how to do something. At least he did it slowly enough for me to see and follow, and he was willing to repeat it if I needed to see it again. The true helpfulness of his instruction was his getting me to do it a few times myself until I more or less mastered it, or at least journeymanned it. I found this Wednesday puzzle easier than yesterday's Tuesday puzzle! Anyone else? Hardest for me was SW with the BAMA/MAV/JAYS sports crosses. We have seen BAMA before. TE AMO is easy Spanish I talk. SONTAG is famous; have not read her, though. HEJIRA and CARL unknown. Way cool that today is the birthday of JONI MITCHELL. It is also my mother's birthday! 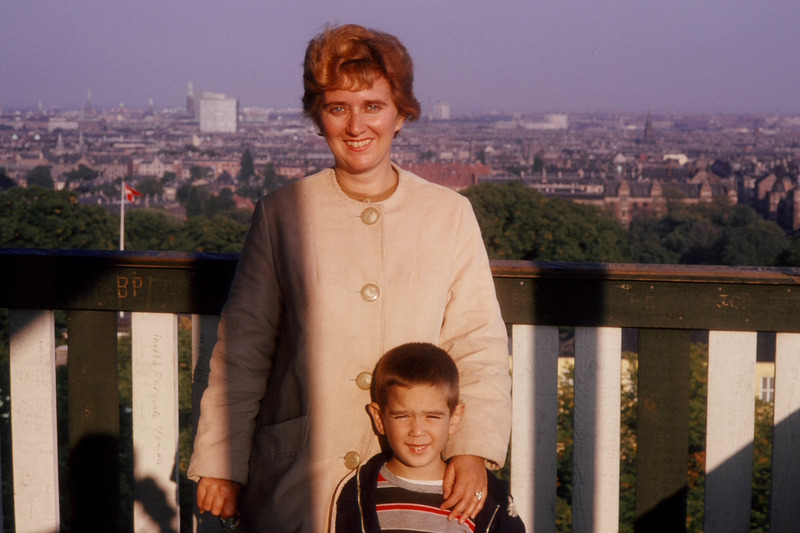 Here is a photo of my mother and me in 1963 at the Copenhagen (DENmark) Zoo tower, overlooking the city. Here is a photo of our family from last Christmas including my mother and my NIECE whose name is also HANNAH. Never heard of HANNAH Storm. Learning moment that Judy Collins recorded BOTH SIDES NOW before JONI MITCHELL did. I saw Judy Collins perform here in 2007 and she made a joke about how people confuse the two of them. I am not sure if I have seen JONI MITCHELL perform. Loved the clue "Mined-over matter"! Jinx I assume JINX was a gift to you? Mike Sherline glad you share my fascination with what people do and do not know. I share your view of categories of enduring importance vs passing fashion and transient interest. Glad you agree that the Palm PDA was more functional than the smart phones that replaced them. Bill G and billocohoes I also looked up the origin of Doozy. As noted, it was in use before the Duesenberg came along. It seems to derive from the word "daisy" which meant something of good quality to be prized. But it is not known for sure. Husker Gary sorry I missed that you also posted the FACT quote! Great minds think alike! And sorry for the loss of your NIECE. Very sad indeed. Here again are some memorable DUNE photos. I have other DUNE photos, but I thought those were worth reposting. In the beginning, I could not get anyone to listen. "her voice is too high and squeaky" people would say. Compare this to Joni in concert, fascinating! P.S. I learned this song as well as I adored it. Cool theme - JONI MITCHELL. Very appropriate in this year of the Woman, and with so many femmes newly elected to Congress! DR: A plethora of diagonals, too many to treat individually. There are three on the near side and another in the mirror, four in all. Perhaps the Jacobson/Varol team is honoring our women in combat? to on my way to the dentist for root canal. by a groundbreaking use of Bass Guitar. CED, I'm sure your brain knows that the name of the song is "Suite: Judy Blue Eyes" even if your fingers don't. CrossEyedDave... you and I are totally on the same page about Joni Mitchell. Loved your links. Enjoyable theme for me. As D-O implied, I'm a bit of a fan. Despite that, I really struggled with Hejira. Had never heard of that album, but know several of the cuts. The other theme entries were quite easy, but that one was all perps that I didn't entirely trust. Oops. I cited the wrong album. It's from Night Ride Home. With the S, I thought of SERGE, too but didn't ink it. Spelling NIECE was my big challenge. Thanks Spitz for the write-up. I had a relatively slow FIR. I shuddered when I realized the MR and "Patti" we're expecting long pop music fills. When I saw JAYS I couldn't think of a first name. But I found I was familiar with two of the songs. And clouds are fascinating in Florida. Along with the lightening. Oops .Sorry about the redirect on "Them"
CED @1337 I'm with you. How can you not love that voice, those tunes and lyrics? I don't play guitar, but I play bass and ukulele and understand how it works. All those alternate tunings completely baffle me; they produce different sound qualities because of different inversions of chords than could be produced in standard tuning. Jaco Pastorius is still considered one of the great bass players of all time. Thanks for posting his chart - I'm going to try to learn it, though I don't have any effects pedals. Big Yellow Taxi was a revelation to me - she came out and said what I'd been thinking for some time, but hadn't been able to articulate with such clarity. I always thought it was "You take paradise..." Thanks to your link I now know it's "They paved paradise..." And I love the rest of the first line, which I think only appears once or twice in the whole song: "With a pink hotel, a boutique and a swinging hot spot", which I feel really drives home the message of greedy materialism and love of the trivial, transitory pleasure and profit winning out over love for and preservation of the Earth. Of course it's gotten so much worse over the intervening years that more than a few crazy fringe people (hippies?) are becoming aware of it, but still the vast majority of us aren't willing to give up anything to try to turn it around. I want my arms free, I don’t need no stinking MANBAGs. If only the fashion police would stop saying 8-pocket cargo pants are unstylish.But I ignore what they say about Hawai’ian shirts, too. Thanks JzB for the music infused expo. //"Hot Hot Hot," I knew. Fav: c/a at ORE was pretty cute but I'm going w/ the CSO to JINX today. O-Zero hundred hrs, Jan 1, 1970 is UNIX's EPOCH. Time is counted as the number of seconds since then. 32bit systems will run out of seconds at 03:14:07 Jan 19, 2038. Think of this as the next Y2K problem and plan ahead accordingly. HG - those milestones w/o the milestonee are the hard ones as I'm sure you know. My condolences. Nice to see you AveJoe. Anyone ever play Axis and ALLIES? In high-school, that's how us nerds oft spent our Saturday night. PK - I'm curious, do you have a buyer for your soy? I heard on Market Place last night that, with the China-tariffs, silos are filling up and some folks have their soybeans in bags still out in the field. Good luck! TTP - I read the Faux Pas and knew most. The ones that really made me "go uhm?" was drinking coffee on the train in Japan and drinking coffee with a meal in Italy... What about breakfast?!? I cary a backpack [that I do not consider a "Man Bag" 'cuz my daughter carries a Backpack too! (Jinx nailed it - murse, that's a man-bag)]. Backpack holds my laptop(s), various cables, spare charger-battery, lockpicks, wallet, bills to pay, the daily crossword, and whatever tonight's reading materials are. It's Splunk branded with a Cylance "I [heart] AI" (where the heart is Cylance's logo) "lapel-pin" on it. Billo - I'm w/ you on cargo-shorts when I'm not taking my backpack with me. Finally finished at dinner time. Busy little bee. LIKE SO was heard frequently as I was growing up. No more time; gotta run. Have a good night. Tony, I sell my soybeans to the local large ag co-operative, but the price is about 30%-50% lower since the China tariff idiocy. The coop sells to bigger companies for national & international shipping. I can't imagine anyone leaving their soybeans in bags in the field. My farmer thrashes the beans with a combine (machine) which has a 40 ft. swath of the cutting header. Beans are augered into a semi truck trailer and hauled to the big elevators. No bags ever. The co-op has some covered trench silos for over-flow. This is a big business run by smart people or they don't survive. If the politicians, big grain companies, commodities market speculators, and weather conditions all cooperate, it is a fine business. But once again the big pol has screwed it up. Very late to the party, but this was a fun CW. Thanks Michael and Patti, and JzB. I knew JONI MITCHELL and a lot of her music, but not HEJIRA. Hand up for RPMS before REVS. Unknowns filled in by perps included SONTAG, HANNAH and PAC. i smiled at those JAYS playing at the Rogers Centre (formerly Sky Dome). I was trying to fit Igloo into the space and was smiling after our recent discussion of snow houses. I didn't know the Inuit spelling, but how can this Canadian have a PEEVE about using a U. LOL! C, Eh! - I was thinking rAYs @55d and re-read the clue - the 'centre' bit tipped me off that it was Geddy's fav team, the JAYS, up in The Great White North. PK - Ouch! 30-50% is a heck of a cut. Here's the Marketplace story I heard. PK - I know farming big-biz and run by smart folk. Let's see if I get this straight... 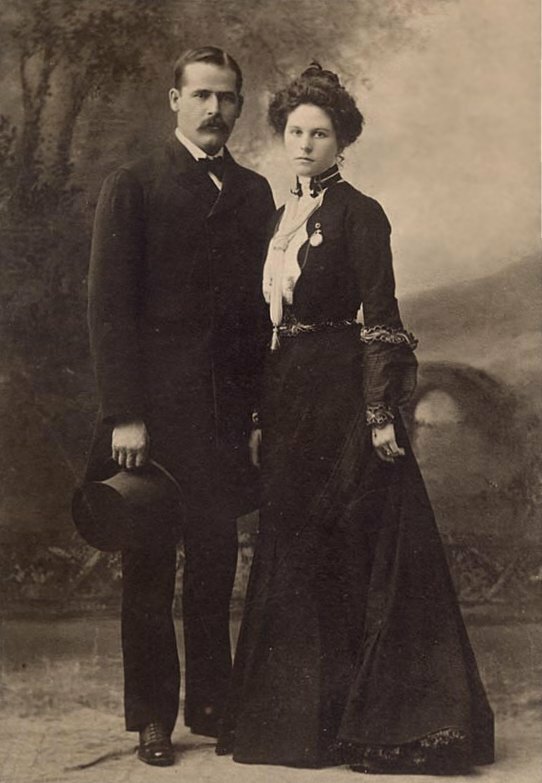 Mom's 4th hubby's Dad was WWII vet, went to Yale on GI Bill, returned to IL and built a minor empire (purchased quarries near-by and ++acreage; over $4MM + equipment and buildings when he passed). And, those combines, they aint cheap! [here we go again... //details are sketchy] Sis's [the one with the 4 layer-cake w/ a knife in it :-)] hubby's Dad has acres outside of Chatham, IL and it's also a working land. Lot's of figurin' goes into every years' crop. A good year got him invested into a local watering-hole which, some years, makes more money than the land.